The creator of the fantastic Image Comics title 'Eclipse' has launched another sci-fi series that asks the question, what if aliens made contact with earth but not to conquer us but to negotiate a business deal. 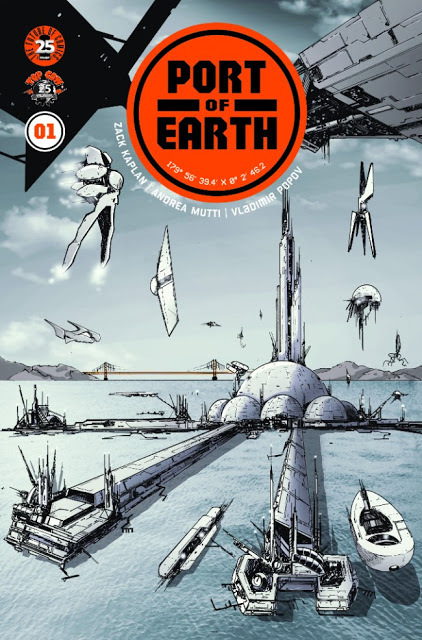 'Port of Earth' examines that premise with a briskly paced first issue that sets the table for some interesting storytelling dynamics. Any story but especially a sci-fi story needs a hook and writer Zack Kaplan has stumbled onto a great premise that makes aliens a shady business partner instead of an intergalactic villain. The documentary-style narration of the story complete with newscasts provides all the backstory we need. The solicitation succinctly describes the history of the aliens arrival. "Imagine if aliens came to Earth not in war or peace, but with a business deal: open up a spaceport here on Earth in exchange for advanced technology. But when our alien visitors break Port restrictions and wreak havoc in our cities, it falls to the newly formed Earth Security Agents to hunt down and safely deport the dangerous rogue aliens back to the Port of Earth." This arrangement creates an uneasy alliance between humans and aliens leading to some subversive commentary about xenophobia, prejudice, and automation. The exposition gives way to the assignment of two ESA agents who investigate a mysterious death in the midst of an important meeting between representatives of earth and the alien coalition known as The Consortium. Kaplan covers a lot of ground building this world even acknowledging the displacement of human workers in favor of alien technology that was provided in exchange for the port where alien travelers can refuel with our ocean water. It's become a turbulent and controversial collaboration that has sown plenty of distrust and intrigue. This first issue is mostly set-up and table setting but there's great potential that provides just enough of a hook to come back for issue two. The possibilities are endless where this story can go. Mix in a mysterious murder and less than transparent alien business partners creating discourse among the citizens of earth and you have a volatile situation ready to explode. All of this works because the art is so good. Andrea Mutti's clean crisp line work gives this futuristic looking landscape a clinical appearance that evokes technological advancement instead of dystopia. It's virtual black and white with very subtle coloring from Vladimir Popov. 'Port of Earth' is one of this week's recommendations for its promising debut. We're hooked and Kaplan has set the stage and now must deliver. This is a well-executed high concept sci-fi narrative with plenty of intrigue and real-world parallels. Be sure to grab a copy.